Since its launch four years ago, Snapchat has been adored by millennials and has perpetually bemused marketers. With an app that is so incredibly popular, and perhaps even synonymous with today’s teens, marketers have been hoping for an opportunity to connect with the app’s audience. This February, Snapchat announced paid on demand geofilters, which is a low-stakes point of entry for marketers to finally test Snapchat’s platform. On-demand geofilters are the most affordable advertising opportunity Snapchat has put forward to date, with rates starting as low as $5 based on the length of time and size of the geotargeted area. This is not Snapchat’s first attempt to monetize filters, as it tried with the “lens store.” While the feature has since been suspended, Snapchat has instead shifted its focus to opportunities around advertising. Snapchat has recently introduced paid ads into the “live story” and “discover” sections of the app. While these ads are great to big brands, smaller brands may not have the budget to place an ad in these sections. However even now with the affordable new geofilter option, many brands still have some serious questions how exactly it connects with their audience through the app about its’ potential ROI. You may be thinking… is Snapchat relevant to me even if my business doesn’t target millennials? While it is true that a large portion of Snapchat’s audience are millennials, if you plan to grow and continue your business for 10-20 more years, millennials will one day become your customers. Snapchat’s focus on capturing micro-moments and sending quick shares to friends and family, is a trait that will most likely expand to new social platforms in the future. Geofilters give you an opportunity to easily connect your brand with the growing number of active users on Snapchat. Snapchat is unique from most social apps currently available in a lot of different ways, but the most dramatic difference as a user is how passive the app can be. The mindlessness of taking a picture, adding a filter, and (maybe) some text, makes snapchat a very user friendly app. Over 60% of users regularly generate content on Snapchat. While other forms of social media see larger portions of their audience base as consumers or “lurkers” who just view content, instead of adding their own. 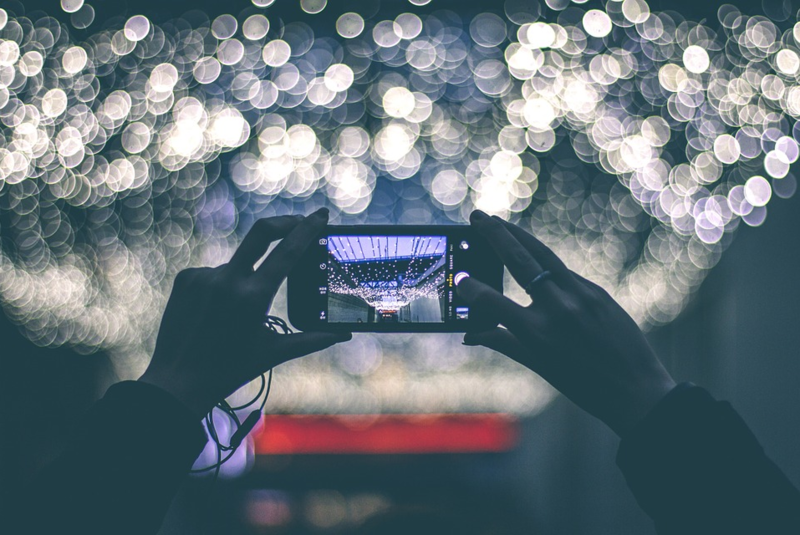 Geofilters encourage users to make content – and it gives users a fun reason to open the app whenever they are in a new location, just to see what interesting geofilters are available. As an active Snapchat user (and millennial), I’ll swipe through the filters and if one catches my attention, I’ll go ahead and use it. What if My Brand Doesn’t Have a Brick & Mortar Storefront? Even if your brand does not have a storefront, there are still a plethora of creative opportunities to use a geofilter to promote your brand. An industry event offers a great chance to experiment with geofilters. The benefit is twofold; it gives attendees a reason to share pictures from the event – all branded with your company’s logo, and it connects your brand name to thousands of people who may not have been at the event. This year at SXSW, brands such as Samsung, used the Snapchat update to their advantage, by tailoring ads and custom geofilters to the conference’s attendees for the first time. Expect this to be a recurring trend at major events, both in the pop culture world and at industry events alike. Do you work for a local company who is proud to support the community? Perfect! (Seer is too) A geofilter is a great way to gain local exposure. Does your company sponsor local Fourth of July fireworks? Is there a 5K race this summer? High School Graduation? Any of these events offer a great opportunity to promote your brand in a creative way. Keep in mind that Snapchat’s audience is young and wants to be entertained–creativity is essential. For example, Hofstra delighted students with a spring-themed tulip geofilter. While these small town events are great if your brand fits, don’t forget about mainstream high traffic events where you can expand your reach as well. Opportunities here would include targeting the Phillies’ parking lot on game day or geotagging around an airport terminal–where people are actively killing time (and posting the obligatory airport filter snap to their story). Does your company talk about having a fun, and vibrant culture? Snapchat is a excellent way to get that message across. Why not turn a fun holiday like Star Wars Day (May 4) or National Donut Day (June 3) into a fun snapchat campaign in the office! Some great examples of geofilters that celebrated holidays locally, were the the minions movie studio July 4th geotag or cleveland.com’s fun leprechaun on Saint Patrick’s Day. Pop up events are a great use case for on demand geofilters. Let’s play through the scenario of free samples on a college campus. As the vendor, you’re focused on bringing people to your table, so you set up in the student union – or set up a chart outside a main college campus building. With geofilters, Snapchat lets marketers combine social media and millennials’ FOMO (fear of missing out) better than ever before. Geofilters are a simple, organic way to generate more buzz about your event. You would be surprised how fast a geofilter could circulate around an entire college campus or high school. An on demand geofilter that provides quick information about where the table is and what you’re giving away – can turn a trickle of students into a crowd. The diversity of geofilters runs the gamut, from Dunkin Donut’s announcing pumpkin coffee to protesting wasteful spending in DC (thus the “pork” in Kasich’s geofilter). Along with the freebie foam footballs and pens, Snapchat’s geofilter should now be a standard part your career fair, or trade show checklist. Using a geofilter at a career fair offers brands a unique way to stand out among hundreds of other companies competing for the same talent and offers a tangible way to show just how innovative your company really is. One important caveat is that Snapchat currently limits the number of geofilters (including paid ads, community, and on-demand geofilters) to seven at any one time per location. As the number of competing geofilters expands, Snapchat may eventually opt for a system similar to the Google AdWords bidding auction. Presently, Snapchat only reports the number of uses and impressions for geofilters. 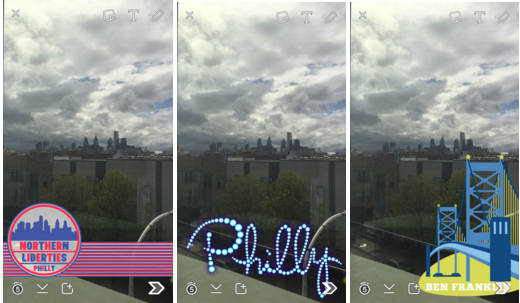 While it will be interesting to see if and how Snapchat builds out a more comprehensive analytics platform, in the meantime there are still ways to track how effective the geofilter was. While marketers are limited on snapchat metrics, in the meantime check out this post by Nick Cicero of Delmondo on creative ways to measure your Snapchat success stories. Since Snapchat tracks the number of screenshots on each part of the story, you can use user screenshots as a “vote.” If you’re a clothing retailer, the “Snapstory” is a great way to showcase a handful of outfits each day. To boost user engagement, ask your followers to screenshot their favorites (be sure to tell your followers to vote by screenshotting at the start of the story). While limited, the feedback Snapchat provides to all users is still relevant. While the data may not be as deep as Google AdWords, that’s not a reason to discount the value of advertising on Snapchat. Like any marketing campaign, being able to demonstrate success and ROI are paramount, and while Snapchat may not be the easiest to demonstrate ROI with just yet, one metric Brian Honigman touts is the story completion rate. Depending on the use and the size of the event, a geofilter might lead to an increase in site visits. Make sure you create annotations within your Google Analytics data to judge any change in metrics due to your geofilter. In the week following the geofilter’s appearance, watch for an increase in new users or overall site traffic. The overall success of on-demand geofilters appears to be off to a strong start. Snapchat has a new way to monetize their platform and brands have the long awaited ability to advertise without the high demands of the “discover” section. As the viability of on demand geofilters solidifies, don’t be surprised to see Snapchat expanding geofilters’ capabilities. Snapchat could soon create the option for clickable geofilters, allowing users to click through links or download an app after posting their snap.